Have you ever tackled a room makeover and just didn't have the time, energy, and/or budget to install new flooring? You feel stuck with flooring you hate, but it doesn't have to be that way! 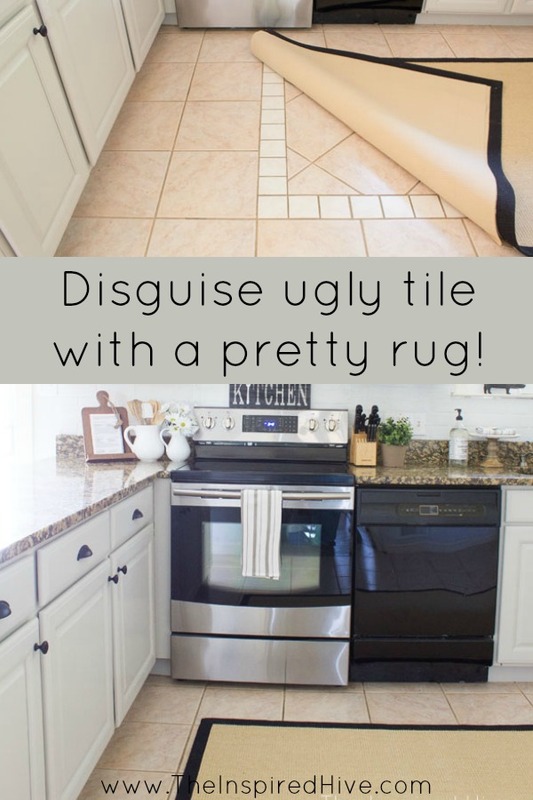 If you followed along for our kitchen makeover for the One Room Challenge, you might recall that I mentioned in my design plans that I wasn't a fan of our tile floors and wanted to find a way to either change or disguise them. Well, I think we pulled it off pretty well! This post is sponsored by Rug Pad USA. I only recommend products that I love and that I think my readers could benefit from. All opinions are always my own. For more information, see my disclosure policy. I've never really been a fan of the tile in our kitchen and have dreamed of replacing it since the day we moved into our house, but it wasn't really feasible to add it to the massive to do list we had on a six week timeline for the One Room Challenge, and it also wasn't something I wanted to budget for at the time. 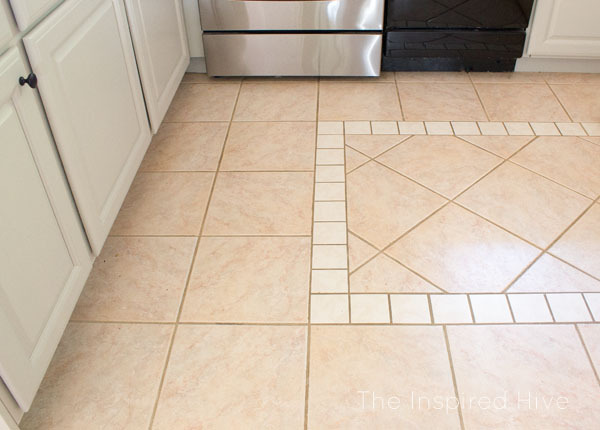 Although the tile isn't something I would have chosen for myself, it is at least tolerable... except for this awkward section in the middle of the kitchen. It's outlined in smaller tiles with the inside tile in a different direction than the rest of the kitchen. It's just way too traditional for our taste and is very distracting to the eye. It also doesn't really go with the new colors or theme in the kitchen. I wanted to find a way to hide that section of tile and also tone down the colors of the tile to flow better with the rest of the kitchen. 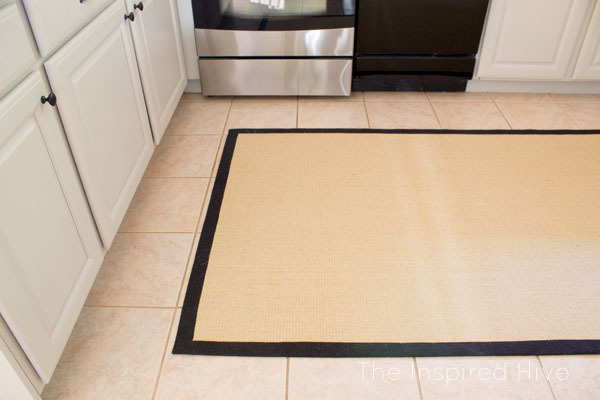 I decided a jute rug would be perfect for the farmhouse feel in our new kitchen. I chose one with a black outline to help it blend in with the other black modern farmhouse details in the space. 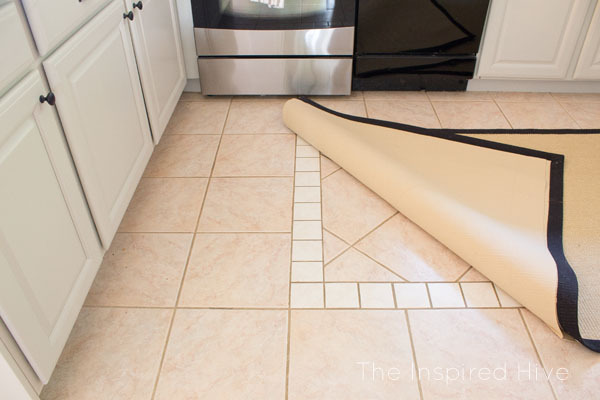 Have you ever put a rug on a tile floor? We previously had a small rug in front of the sink, and the problem is that rugs on tile slip and slide all over the place! The solution of course, is a rug pad. Of course, everyone has bought a rug pad before that doesn't quite do its job... they either don't quite fit under the rug or they still slip across the floor. Well, I finally found a great source for reliable rug pads. Rug Pad USA has specific types of rug pads for every flooring situation. They also have a buying guide and great FAQ page to help you make your selection. They hand cut each pad to ensure a great fit under your rug. 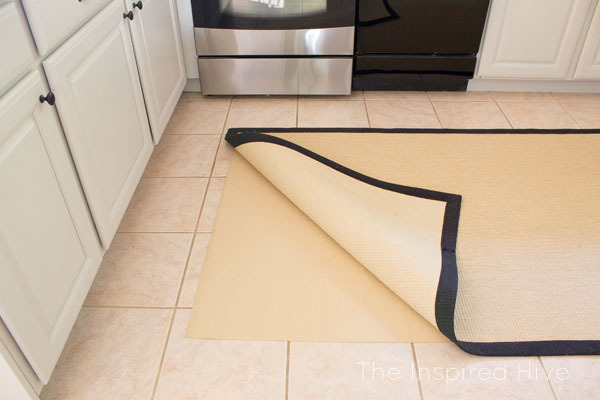 I chose the Anchor Grip rug pad for our kitchen. It has a slim, low profile that makes it completely unnoticeable. It's also surprisingly comfortable which is a relief for tired feet when you're cooking in the kitchen and would otherwise be standing on a hard tile floor. The pad fits perfectly under the rug, and we've had zero issues with it slipping. Our rug is staying put! 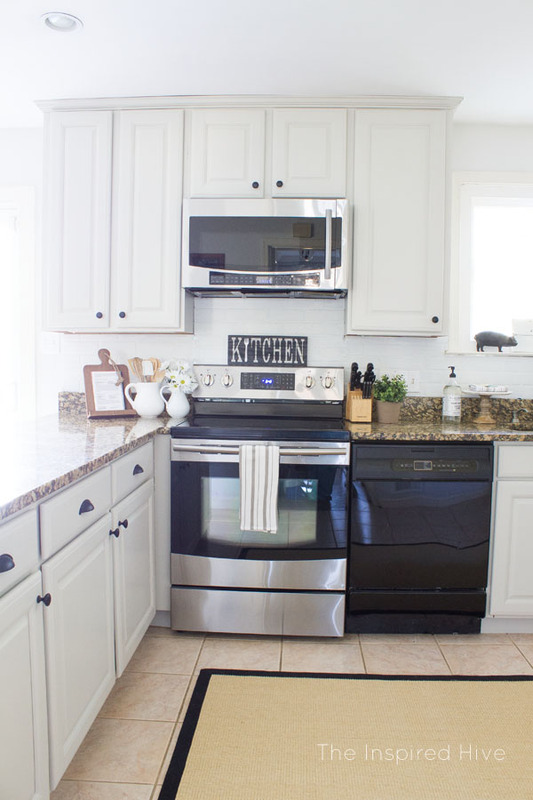 Don't forget to check out the rest of our kitchen makeover! The freshly painted cabinets and the skinnylap feature wall are some of my other favorite parts! Until next time, my friends! Have a great week! wanted so badly to find the wood slice ornaments from your IG...it said search the wood slice ornament tutorial...I've looked everywhere but don't see a "search function" on your blog? Possibly it could be covered up by the ads. I know it's frustrating for you as bloggers..the ads are necessary but sometimes they are what I call "aggressive"...they jump around the page, cover up content I'm trying to read, they won't "X" out and the ones with audio keep repeating with no way to stop them. It's so distracting and makes the page hard to navigate. I just had to turn down my sound:(. I love your blog and you are so talented, just thought I'd let you know my experience!! Thank you for sharing your experience with me, and I am so sorry you were having difficulties. I work closely with my ad provider to set limitations on annoying ads, but sometimes some slip through the cracks. I have shared your comments with them and hope to get it corrected soon!